Triton XXII, Lot: 1220. Closing Jan 07, 2019 at 5:00:00 PM ET. 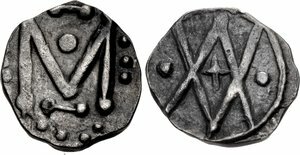 MEROVINGIANS, Marsal. Circa 620-640. AV Tremissis (14mm, 1.30 g, 5h). Gisloaldus, moneyer. Triton XXII, Lot: 1221. Closing Jan 07, 2019 at 5:00:00 PM ET. MEROVINGIANS, Marseille (region). Circa 725-750. AR Denier (12mm, 1.24 g, 6 or 12h).